Though it landed in Japan in late 1988, it would be February 1990 before Super Mario Bros. 3 would grace the NES in North America - painfully, it didn't hit Europe until August 1991. That was fairly late in the NES lifecycle, but a combination of outstanding design and clever marketing made it a smash hit Stateside, and an integral part of Nintendo and Mario history. To provide some context, by the time Super Mario Bros. 3 (SMB3) arrived the 16-bit era was well established with the SEGA Mega Drive / Genesis, with SEGA eating into Nintendo's market share and portraying the company as low-fi and 'uncool'. The NES was, despite its fantastic library, ageing rapidly. The Super NES would eventually arrive in 1991, but it's to the immense credit that the shadow of the Genesis and a 16-bit Nintendo successor did little to dampen the excitement and phenomenal sales of SMB3. The hype began, at least in North America, with The Wizard, a cheesy family movie; its portrayal of Nintendo products - especially that moment with the Power Glove - are legendary in their clumsiness / awesomeness, strike out as applicable. It's the kind of product placement that attracts critical tweets and blog posts nowadays, shameless in its effort to sell games to kids. Then, in a reveal remarkable for its chutzpah and unlikely to ever be repeated in this internet age, SMB3 was unveiled in the movie. There were various factors that made SMB3 a dramatic step forward from the previous conventional platformer, the original Super Mario Bros., not forgetting that the Super Mario Bros. 2 released in the West was a reworked Doki Doki Panic. The overworld, with alternative paths to find; enhanced visuals that utilised the MMC3 (memory management controller) chip in the cartridge. On top of that there were a host of new items, enemies and designs. In addition to impressive verticality and hidden areas, SMB3 is still arguably the most creative and peculiar title in the series. Various items and enemies were inspired by Japanese folklore and the personal experiences of developers. The Tanooki Suit effectively gave Mario a stomp move, flying with the Raccoon suit, and quirkier inclusions such as the Frog Suit and Kuribo Shoe. The Chain Chomp made its début, while the Koopalings also appeared for the first time; various ideas introduced in this title became mainstays in the Mario IP. In terms of creativity, then, SMB3 is an absolute treat, and it also brought tighter controls and mechanics in comparison to its predecessors. It was, and remains, one of the elite NES games. A huge commercial success, the legacy of SMB3 is undeniable. In its own time it kickstarted a Mario craze than even spawned a TV show in North America, and remains a key reference point in Nintendo culture. It's had numerous re-releases, of course, and various items and recurring characters have been integral right through to the most recent Super Mario titles. It'll be a key part of Super Mario Maker, too, with its own template and items inspired by the original. As a late arrival on the NES, Super Mario Bros. 3 was proof of what clever technology, innovative design and wonderful creativity can deliver. It's a true highpoint in Super Mario history. Below, for your enjoyment, is a speedrun of the game from this year's Summer Games Done Quick. I remember seeing The Wizard in theaters and even walking away with the little micro Nintendo Power issue given to viewers. It was just an unbelievably huge deal that remains one of my favorite games today. I'm gonna have to replay a number of Mario games in order to get creative juices flowing for planning levels in Super Mario Maker. Truly my "first" Mario game since I didn't have the reflexes to play any video game until I was four (1990). Wish I still had the original cart + yellow box it came with. Still the absolute pinnacle of the 2D Mario series in my opinion. 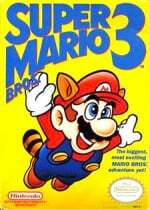 I was more excited about SMB3 than another game ever then or now, It truly was magical. I hope newer generations have an equally memorable gaming experience with whatever game excites them. One of the greats, and it came at a time when Nintendo was at it absolute peak. You guys got a couple facts wrong, unless you're talking about Europe, because Super Mario Brothers 3 debuted October 23, 1988 while the Mega Drive debuted 6 days later on October 29, 1988, meaning the 16-bit era hadn't yet been established by Sega. I still have such fond memorys of playing this game with family and friends at sleep-overs and get togethers definitely in my top five favorite all-time video games category ., As well this is the title that cemented me as a life long Nintendo fan , Long Live KING MARIO .. This is the game that the New series has never even tried to surpass. The game that should've been the STARTING POINT for any 2D Mario made nowadays. Instead we went backwards somewhat (and maybe a little sideways; wall jumping isn't a bad inclusion). And that ain't from nostalgia. Sadly, some of those diverse powerups AREN'T in Super Mario Maker (if what I heard/ read is true). Not even the Tanooki Suit. Hopefully patches and updates are a thing. I used to go over to my Grandma's house in order to play this game and every time I was never disappointed. Such a classic game. I am a huge Mario fan but I've never really liked SMB3. I love the first 3 worlds and of course the air ship stages but I find the rest of the game bland. It's the only Mario game that I've never beaten all the way through. Does anyone feel this way or have suggestions as to why I feel this way? I was six years old when I got this game. I can still remember loving the previous Mario Brothers to death, but what made 3 special was one newly added mechanic. Mario could fly. When you're six and you've always been used to being on the ground, having Mario fly was the closest thing to experiencing what flying was like. It was amazing. This right here is one of the greats, and will continue to be one of the greats for all of time. Oops I meant News sorry this goofy touchscreen. One of the earliest things I can remember when my sister played it was how Mario did cartwheels when he had Star Power. "Look at how he jumps!" It's those tiny things. I am hoping there will be a sale on the classic mario vc games around the time mario maker is released. Ashamed to admit I never played this game. I was born long after and Mario was never one of my favourite series until recently. It's on my to do list though! I had no idea about that movie reveal, that's crazy! @Kirk Holy cow I remember that commercial! You totally just brought me back to my childhood with that. lol. Thank you. The best mario game IMO. @BoshiBoy In what world did you stayed? World 4 and and the first part of world 5 are almost exactly to grassland counterpart. @Andremario Did you know that after beating the game a third time will turn all those P wings in Hammer Suits? @MetaSmasher I recommend the NES one. The SNES and GBA ones might look pretty, but the NES one has unique elements that they didn't bothered translating to the remakes. @Gridatttack interesting I have actually never played the NES version I will definitely give it a try, and bland may not be the best adjective to use I've played through world 4 and then some of world 7 by warping and I just found the levels to be too similar. I know many people who regard this as the best side scrolling Mario game so I am in no way trying to discredit this game, but I think Super Mario World is the best side scrolling Mario game. While I do marginally prefer World, I think SMB3 definitely wins in the variety and randomness stakes. I love how there's hidden stuff that can be triggered like the coin ships, the pairs card game or even crouching on white blocks to go behind the scenery. So true. Those SMW fanboys will tell you otherwise but SMB3 is the best 2D Mario ever. I remember going to a friend's house who imported a U.S copy early. I was boiling over with excitement to have a shot at it. I don't like the people who bash SMB 2, that was a fantastic Mario game, and very misunderstood amongst the SMB 3 snobs. To this day I've only played SMB 3 through as a borrowed copy, but hopefully I'll finally track down my own! To this day my absolute favorite. The perfect mix of challenge, fun and surprise. @Gridatttack So I should get the NES version. On Wii U or 3DS? One of my favorite Mario games. The variety of power ups is great and the levels are fun to play through. 2 player mode is fun to play as well. I prefer the SNES version since that's the one I played the most, but the GBA and NES version is just as much fun to play as well. Also the battle mode in the SNES version is fun to play as well. Overall, it's a great Mario game. As for levels feeling the same, I don't know what to tell here, other than its true for the first 4 worlds. I suppose you should try to look a bit more into how the level was made and try to find something new that you haven't seen in a past level. Say for example, in level 6 of world 4, you have doors that take you to a similar level, except its normal. You can switch back between the giant and normal versions. No other level in the game has something like this. As for the similarities in backgrounds, this is my main gripe with the updated versions. Say for example, all the desert levels now are in a odd orange sky, while in the NES version, you had the sky in different colors of the day. Despite just being a palette swap, they do give more personality to the level, and prevent them looking the same. This is especially true with level 1 and 2 from world 8, which have their unique palette. As for 3DS, its on the go, and you have a lower resolution, so the game should look more forgiving. Also depends on what you like playing more. So yeah. I still remember that commercial: "Mario, Mario, Mario, Mario!" Its a great game overall. The only issue is that you can't revisit the levels that you've completed. SMB3 is perfection! Even to this day. No Mario game can even come close. I don't give 10s often, but this one deserves all the praise it gets and more. Its really the only game that a developer was confident in that they marketed it in this way. It can't be replicated. Ever. Even if you imagine a game ever releasing without bugs today, Nintendo did it first and the gaming landscape was concentrated almost entirely down to Nintendo. I remember the first time I saw this game on display at a store. My tiny hands gripped the controller and I looked at the overview map. I could choose level 3 or 4 and my head exploded. Growing up my sister and I used to play this every summer. We restarted it, I don't know how many times. It's simply a platforming masterpiece and shows Nintendo at their prime.